We stand with those who need assistance building their families. Join us for National Infertility Awareness Week. Change the conversation about infertility and #FliptheScript. Anybody can be challenged to have a family. 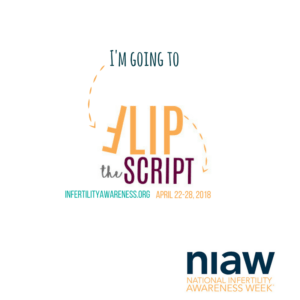 Help us #FliptheScript this year during National Infertility Awareness Week. Did you know infertility impacts 1 in 8 families in the U.S. today? It’s time to #FliptheScript on infertility to help others realize the far-reaching effects and consequences of turning a blind eye to a medical diagnosis. Did you know that most people struggling with infertility receive no coverage from their health insurance? This inhibits many people being able to move forward to treatment to resolve their infertility. Let’s #FliptheScript to educate others and change their perceptions. Let’s #FliptheScript for employers that do not include infertility treatment in their health plans. Many do not know or realize the impact of infertility on a family if they’ve never been through it nor do they realize the limited access to appropriate coverage and care. Did you know infertility is a medical diagnosis? Cancer, injury, or simple genetics may be a factor in a family’s inability to conceive. Don’t just assume that others know the facts. Let’s #FliptheScript to show the scope and magnitude of this very real disease! Laws and policies can impact access to many family building options. Let’s #FliptheScript on those that put up roadblocks up to families everywhere and stop the anti-family legislation in place today. There are many ways to resolve infertility if we simply #FliptheScript. Learn more at resolve.org.